Newly-opened Tresind Studio is tucked away discreetly behind the bar area of Tresind, a fantastic modernist Indian restaurant, that recently underwent an extensive refurbishment (see our review for Tresind here). 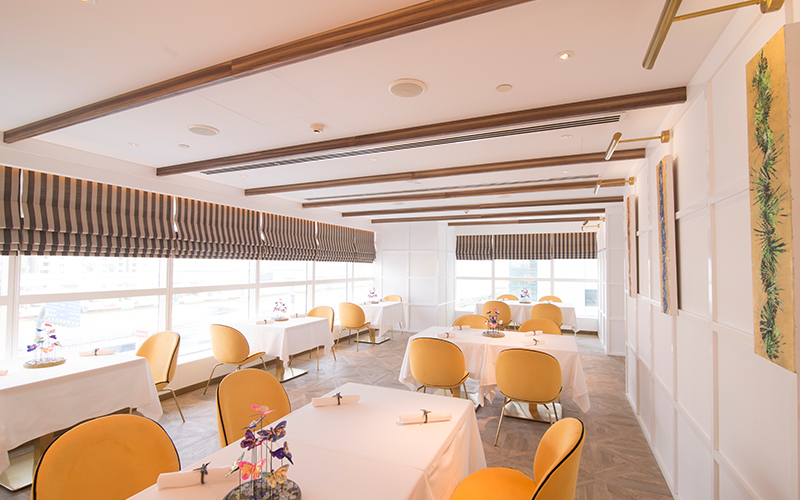 The intimate 20-seater Tresind Studio is an exclusive, VIP dining space that offers an elevated experience. Led by talented chef Himanshu Saini, the new studio serves an exceptional 16-course tasting menu, which is available for both meat eaters and vegetarians. The degustation menu showcases a collection of some of Tresind’s signature dishes that have been favoured by diners throughout the years, which chef Himanshu has skillfully refined. Inside, the space is contemporary and buzzing with the sounds of chefs hard at work in the studio’s private kitchen and from the interactive demo counter, and fellow diners admiring the artistic presentations and flavours in front of them. 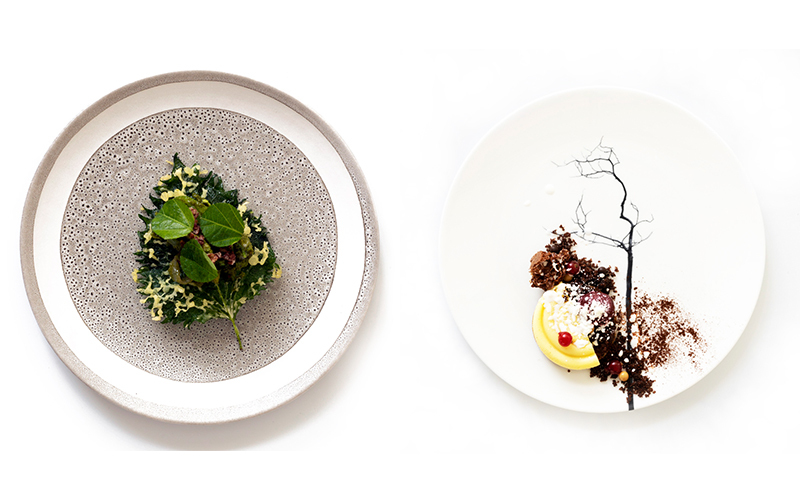 A feast for the senses, Tresind Studio serves up flavour-bursting food that’s creatively prepared and imaginatively executed. I won’t give too much away, but an experience for your sense of smell kick-starts the experience and whets your appetite for what’s to come – a gastronomical journey through avantgarde-inspired Indian cuisine. 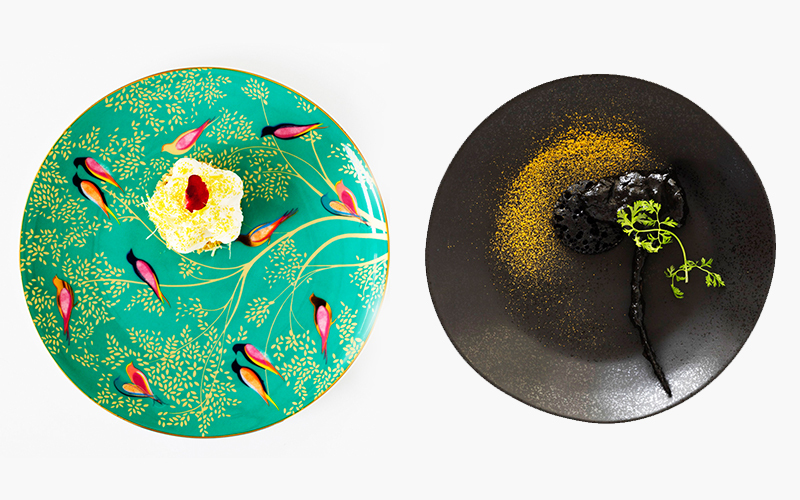 The 16-course menu, entitled ‘Chapter 1’, starts with Tresind Studio’s take on coriander and tamarind pani puri, which is served deconstructed in a homemade ice bowl implanted with coriander leaves. The creative serving dish keeps the food deliciously cool as you dig into the snow-like tamarind chutney, which is fantastically paired with crunchy broken-down noodles made from a chickpea flour (known as sev in India). It may come as a surprise at an Indian restaurant, but only one bread course is served at Tresind Studio, and a very small bread course at that. The most delicious crispy roti is presented hot with a generous knob of butter on the side. This mini portion of roti left me wishing to request another, but with many more dishes to come I was later glad that I refrained. Bite sized little tart bombs of chaat come next, packing so much flavour, before the mushroom and truffle course, which was ultimately one of my favourite dishes served during the evening. Having visited Tresind over the years, chef Himanshu has consistently served a fantastic dish called mushroom chai. This soup-style dish is served from a tea pot and consumed from a tea cup – it’s absolutely delicious and I was excited to see it re-invented at Tresind Studio where it came in the form as mushroom-stuffed ravioli drizzled generously with mushroom and truffle-infused consommé. John Dory with mustard is course 5 and a delight to eat. The fish comes tightly wrapped in a crispy noodle shell with a spicy honey mustard on the side for dipping. The flavour fun doesn’t stop there, as curried chicken and shisho leaf comes next. The full shisho leaf boasts a light tempura coating, is wonderfully crisp and acts as a bed for the chicken pieces that sit on top, which are tenderly cooked with balanced mixed spices. An interesting course of ghee-roasted prawns with watermelon is now served. This rasam (soup) dish offers smoky tastes from small bites of feta cheese and delicate watermelon with the prawns, which all come together to combine harmonious creamy, fruity and slightly spicy flavours. Reaching course 8, my favourite dish of the night is served – lamb and black pepper. The tenderly cooked tandoor lamb chop is slathered in a rich masala gravy and accompanied by a crisp tuile filled with a yoghurt-based filling, which balances the spiciness of the masala sauce. Able to request additional servings of any of the courses, my dining partner devoured a second portion of this dish – a firm favourite at our table. To neutralise the palette, a transitional course that moves us into the mains arrives. The buckthorn-flavoured sorbet palette cleansers are topped with popping candy and served in clam shells. The playful wagyu and curry dish that is served next features cooked-to-perfection tenderloin surrounded by five different curry sauces, ensuring that no two bites of beef are the same. Things get interactive for course 11, when chef Himanshu invites us over to the demo counter to watch him prepare the lentil and rice dish. Faced with a giant slab of marble that’s been laser cut into the shape on India, the real-life map houses 20 different ingredients from all over India that are incorporated into the dish, ‘khichdi’ – India’s national dish. One by one chef Himanshu adds each ingredient to create the hearty and wholesome dish. If you have a sweet tooth, you’re in luck as not one, but four sweet courses follow. First up, the pre-dessert course of pineapple carpaccio and coconut pudding provides a delicate introduction to the sweet flavours, followed by the chocolate and cherry course, which is a take on Tresind’s famed deconstructed black forest cake. Served with frozen whipped cream and crumbly Aero-like bubble chocolate, this dessert is a silky, creamy dream. Revealed through a magnifying glass, the saffron and milk course is playful and theatrical – inviting the whole room to take part. Petite fours with tea and coffee served from a dedicated beverage tableside trolley complete the magical dining experience. Service at Tresind is always unfaltering, yet somehow the team at Tresind Studio manage to take things up a notch and truly provide a first-class service experience. You’re in for something special at Tresind Studio. Head here for gastronomical experience to remember, or a special evening out with you loved with or a small group of friends – you’re sure to be impressed. Want to go? The 16-course tasting menu at Tresind Studio is priced at Dhs450++ for the vegetarian option, and Dhs475++ for the non-vegetarian option. For more information or to make a reservation, call 04 308 0440 or visit tresind.com/en. If you enjoyed this article, you may be interested in reading more of our reviews here.